The Missouri Western Master of Business Administration (MBA) programs are AACSB accredited professional degree programs that offer students, of all educational and professional backgrounds, a broad business education to help launch or advance their professional careers. The programs focus on applied academic education to develop a student’s analytical and decision making abilities. Missouri Western has both onsite and online MBA program options. Both MBA programs include classes covering several business disciplines such as accounting, finance, marketing, and management. The programs are designed to accommodate working professionals seeking to advance their career as well as recent graduates eager to advance into graduate studies. Both MBA programs are a total of 30 credit-hours (10 classes). Consistent with Missouri Western’s mission as an open enrollment institution, our MBA programs have multiple admissions paths that include but not require a GMAT score. Our MBA has been named one of the best AACSB-accredited programs that doesn’t require a GMAT or entrance exam. 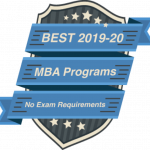 With an MBA program that is uncompromising about providing an exceptional student experience and high quality instruction, we are proud that Missouri Western’s MBA has been chosen as one of the Top Picks for the Best MBA Programs with Zero Entrance Exam. The Missouri Western onsite MBA programs are professional/part-time graduate programs in four separate concentrations. Classes generally meet one night a week for sixteen weeks. Students can take one to three courses a semester. Classes are in the late afternoon, or evening, on the Missouri Western campus. The Missouri Western online MBA is a professional and part-time graduate program where students can take up to four classes per semester in two eight week sessions. The MBA is completely online and consists of eight week sessions, which allows full-time students to complete the program in 12 months. The classes are offered by Missouri Western through Canvas course management software. The program consists of ten courses which includes seven MBA core classes plus three additional classes in leadership, ethics, and organizational behavior management. Onsite and online delivery options are available with this concentration. The General Business concentration is offered onsite as well as online. The online option is a one year accelerated program.